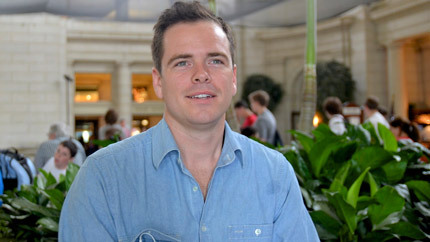 Fulbright U.S. Student alumnus Patrick Dowd of the Millennial Trains Project. “It was 400 Indians and one American,” Patrick explained. The trip, known as the Jagriti Yatra, takes Indian young people from the “Millennial” generation on a 15-day trip around the country to inspire Indians to become entrepreneurs. “It is a project for emerging pioneers of our generation,” Patrick said. “It really tapped into the entrepreneurial energy of rising India.” After he returned to the United States, that energy and his exchange experience inspired Patrick to create the Millennial Trains Project (MTP). The project, which had its inaugural voyage in 2013, encourages entrepreneurship in the Millennial generation. It will carry 25 young people from Portland to New York and stop in eight cities along the way for the participants to learn about the challenges and opportunities entrepreneurs face in different parts of the United States. Participant project proposals must be based on one of 10 themes: Makers, Explorers, Intrapreneurs, Innovators, Entrepreneurs, Advocates, Veterans, Academics, Public Servants, and Performers. The first 25 submissions to reach a goal of $5,000 of crowd sourced funds will be invited to participate on this 10-day adventure. The most important thing, Patrick said, is to encourage others to pursue their own good ideas. “Don’t let anyone talk you out of your own ideas. Our whole system makes people want validation, but that’s not an entrepreneurial mindset,” Patrick said. His own advice worked well for him. He approached his investors, and announced, “I am doing this,” and has since partnered with National Geographic Traveler, Opportunity Nation, the National Association of Railroad Passengers and other organizations to make MTP a reality. Patrick’s Fulbright to India provided more than the idea for the MTP. As things were getting off the ground, Patrick mentioned the idea to a fellow Fulbright U.S. Student to India Meg Kelly, whom he had met on the first day of their orientation. Meg was so excited by the idea that she turned down a graduate school scholarship to join MTP as its creative director, and according to Patrick, was instrumental to the growth of the project in its first year. Both Patrick and Meg attribute their time in India as Fulbright U.S. Students as the impetus for this project. The 2014 MTP Journey will include five Fulbright Foreign Students, who submitted project proposals for the voyage. The student participants will share their experience through social media. This journey is a continuation of the MTP model, encouraging innovation and collaboration across cultures. Its collaboration with The Fulbright Program will increase mutual understanding between the Fulbright Foreign Students, the other Millennials on the train, and the people they meet on the voyage. Visit the Millennial Trains Project site to learn more.